Hell strip. That's another name for the skinny little plot of land sandwiched between two expanses of concrete -- the sidewalk and the curb. Although technically owned by the city, this narrow median plays a major role in the first impression visitors receive of your home. Talk about potential for curb appeal! Problem is, that we’re looking at one of the greatest landscaping challenges a gardener will ever face. Sprinkled with salt in winter, baked by the sun in summer (with the reflection off the asphalt pavement, soil temperatures can reach up to 150 degrees), and used by dogs as a public convenience all year round, the hell strip doesn’t get much respect. There are ways, though, to turn it from hellish to heavenly. Just keep the word "low" in mind. 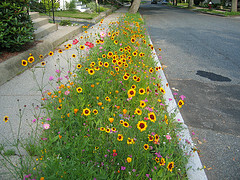 If you’re not already actively xeriscaping, your curbside strip is the perfect spot to begin to experiment. Start by planting a drought-resistant, evergreen ground cover such as woolly thyme or mondo grass which will look good in every season. Be sure to choose a species that is able to hold up under a certain amount of foot traffic, whether from drivers getting out their cars, playful neighborhood children, or inquisitive pets. Next, to add enjoyable color and scent, fill in the area with a variety of low-water flowering plants. For instance, drought-resistant verbena loves strong sunshine and has the extra advantage of attracting butterflies to your mini garden. Another advantage of using a suitable ground cover is that it will serve to keep weeds at bay and reduce your gardening workload You’ll also want to select easycare flowers that don’t need a lot of deadheading or dividing. Vigorous, low-maintenance perennials are ideal; try dainty Santa Barbara daisies or brilliant orange day lilies. Mulching is a useful measure that wards off weeds and helps to hold in moisture. However, some towns do not allow bark mulch curbside, as it tends to run off and block the storm sewers. Gravel mulch, kept in place with attractive edging, is a good alternative. Local code will often limit the height of median plantings (including containers) to a maximum of 3 feet for safety’s sake, so that you don’t block motorists’ view of the adjacent sidewalk and driveways as they pass by or park. This tends to rule out the possibility of raised-bed gardening. However, low planters are a practical alternative for dealing with the compacted, nutrient-poor soil you’re likely to find in your median; they are also convenient to take indoors in winter, if you wish. Be aware that municipal regulations may require a permit to plant anything but flowers or grass in this spot. (Check the requirements of your HOA and utility companies-- which may have cables or plumbing pipes buried in the area -- as well.) Any existing trees must be kept neatly pruned back. For the most appealing esthetic effect, coordinate, don’t clash. Tie your curbside planting in visually with the rest of your property. For example, you could use the same type of flower that grow along the sidewalk that leads to your front door, or mirror the colors that your home’s exterior is painted. If you have a decorative concrete patio or walkway installed, edge the median planting with a bit of the same material. This will create a feeling of harmony that is pleasing to the eyes, as well as reassuring to any neighbors who were initially sceptical about your hell strip gardening efforts.